“Volunteering at Holy Apostles balances me and challenges me.” Rick Landman, soup kitchen volunteer, pictured here with Rev. Glenn Chalmers. On any Thursday at the soup kitchen, the unmistakable and joyful volunteer presence of Rick Landman cannot be missed. A member of Congregation Beit Simchat Torah, “CBST”, which held Friday night services at the church for many years, Rick has been a vital link that ties together the history of these organizations sharing the same space. Rick has also been an ambassador of the welcoming spirit and legacy of LGBT activism that CBST and Holy Apostles embody. A fixture in the history of Friday nights at Holy Apostles, CBST is now celebrating its first Passover in its new, permanent home, after moving earlier this month. We said goodbye to their physical presence and wished them well in their new home with a traditional procession that took the congregation through Holy Apostles for a blessing by Reverend Glenn Chalmers, seen here with Rick. We’re grateful to know the congregation is close by, and to know that Rick will still be representing their presence at the soup kitchen. Rick’s first connection with Holy Apostles was in the early 1970s when the church became a temporary home for many fledgling gay and lesbian organizations following the Stone Wall riots. Among them was CBST – the first New York LGBT synagogue – which Rick came to in 1973. Twenty five years later, Rick was part of the search committee that selected the Church as a more permanent home for CBST’s Friday night Shabbat service. Thinking back to his return with his congregation to Holy Apostles in 1998, Rick remembers how he didn’t know where he was at first, because of the major renovations after the 1992 fire. It was only a matter of time before he naturally gravitated to the life of the soup kitchen. The son of two German Holocaust survivors, Rick has dedicated his life to education, the law and civil rights. 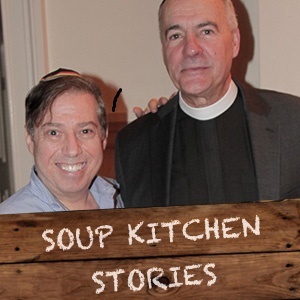 Even with the intergenerational pain from the Holocaust, and the challenge of growing up gay in the 1960’s, the guests’ stories at the soup kitchen often remind Rick of the fortunate circumstances he has been blessed with. “Coming from a rather sheltered life, volunteering at the Holy Apostles balances me and challenges me,” he says. We will miss CBST, and are gratified to know they are just a few blocks away, settling into their new home. And we’re comforted knowing the spirit of that congregation lives on through the dedication that Rick brings to the soup kitchen every Thursday.